Sotheby’s London 3rd December 2014 Evening sale of Old Master & British Paintings is set to be a major highlight of the international auction calendar this winter. The sale is spearheaded by J.M.W. Turner’s Rome, from Mount Aventine, one of the last great masterpieces of British art left in private hands and one of the artist’s supreme achievements (est. £15-20 million). The sale is further distinguished by another masterful Italian view, a quintessential depiction of Venice by Canaletto, as well as unique compositions by Lucas Cranach the Elder, Pieter Brueghel the Younger and Sir Peter Paul Rubens. Estimated in excess of £32 million, the 43 lots also comprise pioneering works in the history of art, including one of the earliest examples of Dutch flower painting and one of the first British bird’s-eye views. Turner’s late works – the pictures he produced from the late 1820s and 1830s until his death in 1851 – are considered by many to be the artist’s supreme achievement. 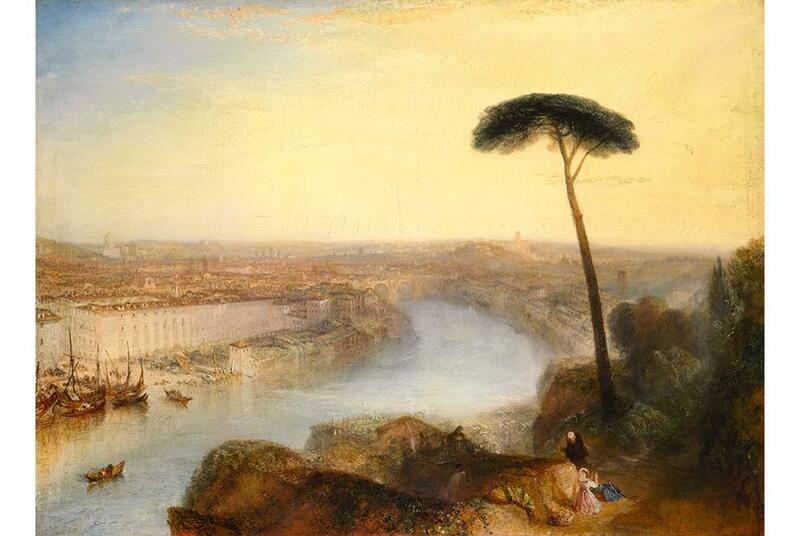 Exhibited at the Royal Academy in 1836, when Turner was 61 years old, Rome, from Mount Aventine is arguably the greatest and most important view of the Italian city ever painted. Rome captivated Turner for over twenty years and this subtle and atmospheric depiction of the city is a brilliant technical feat demonstrating his virtuosity as a landscape painter. In 1836, The Morning Post described the work as “one of those amazing pictures by which Mr Turner dazzles the imagination and confounds all criticism: it is beyond praise.” Based on detailed sketches Turner made during his second trip to Rome in 1828, this magnificent picture was commissioned by the major patron and the artist’s close friend and executor Hugh Andrew Johnstone Munro of Novar (1797-1864). The painting was later acquired in 1878, following Munro’s death, by the 5th Earl of Rosebery, later Prime Minister of Great Britain. It has since remained undisturbed in the Rosebery collection to this day (lot 44, est. £15-20 million / €18,980,000-25,310,000 / $24,070,000-32,090,000). The other masterful Italian view in the sale is an exceptional Veduta by Canaletto, now to be shown in public for the first time since the ground-breaking Manchester Art Treasures exhibition back in 1857. From the beginning of the 1730s, the decade that would establish Canaletto as Venice’s greatest and most famous view painter, this picture depicts The Piazza San Marco on a typically sunny day. The number of variants of this scene painted by the artist throughout his career is evidence of the popularity that it enjoyed with 18th-century visitors to Venice. Other important variants are found in the Museo Thyssen in Madrid and the Metropolitan Museum of Art in New York. The present work enjoys a particularly distinguished English provenance and will be offered with an estimate of £5-7 million (lot 11, est. €6,340,000-8,880,000 / $8,050,000- 11,270,000). The sale will also present The Faun Family, a major work by Lucas Cranach the Elder (1472-1553). Not seen on the market for some 60 years, this composition, unique to the artist’s oeuvre, was painted in 1531, at the height of his career. It was commissioned no doubt by a member of the courtly circle in Wittenberg, where Cranach was in the employ of the Electors of Saxony. This outstanding work is remarkable for the precision with which every detail is rendered. It is part of a series of mythological depictions of wild people, forest dwellers or demigods. The subject had long fascinated the artist and culminated in a series of panel paintings from the second half of the 1520s onwards (lot 13, est. £1.2-1.8 million / €1,53-2.29 million / $1.94-2.9 million). At the heart of this winter’s auction will also be two important Dutch still- lifes. Adriaen Coorte’s Three peaches on a stone ledge, with a Red Admiral butterfly is one of the very finest works by an artist little known during his own lifetime, virtually forgotten in the 18th and 19th centuries but who, more latterly, has become one of the most sought after of all Dutch still life painters of the 17th century. Coorte’s highly distinctive pictures are instantly recognisable for their simplicity of treatment and restricted range of subject matter. Discovered in 2011, this tiny picture (31.3 by 23.3 cm. ; 12. by 9. in.) from around 1693-1695/6 is without question one of the most beautiful recent additions to his known oeuvre and certainly one that confirms his still lifes to have struck a vital chord with the modern mind (lot 37, est. £2-3 million/ €2,540,000-3,810,000/ $3,220,000-4,830,000). Another important Dutch still life is found in the earliest extant flower painting by Ambrosius Bosschaert the Elder (1573-1621). Painted around 1605, Still life of flowers, including irises, narcissi, lily-of-the- valley and carnations, in a tall glass vase set on a stone ledge is amongst the very earliest examples of independent flower painting in the Netherlands. From 1606 onwards there was a sudden and considerable output in the genre by Bosschaert himself but also Jan Brueghel the Elder, Roelandt Savery and their increasing numbers of followers. However, the sophistication of the present work would suggest that Bosscheart may have had an earlier career in the genre of flower painting before 1605 (lot 35, est. £600,000-900,000 / €760,000- 1,140,000 / $965,000-1,450,000). The sale comprises a fine group of Flemish paintings led by an expressive modello by Sir Peter Paul Rubens (1577-1640), The Martyrdom of Saint Paul. Dating from circa 1637, the work is the only known, complete study for the artist’s large altarpiece painted for the High Altar of the Church of the Augustinian Priory of Rood Klooster (also Rooklooster) near Brussels, of which St. Paul was the patron saint. The altarpiece was destroyed during the French bombardment of Brussels in 1695, leaving the present sketch as the primary surviving visual record of this composition (lot 32, est. £600,000- 800,000 / €765,000-1,020,000 / $970,000-1,290,000, pictured left). Pieter Brueghel the Younger (1564-1637/8) features with two pictures, including a late work, A Village Street with peasants dancing. This is a rare example of a unique composition in Brueghel’s oeuvre, and is entirely of his own devising. When sold from the Belper collection in 1973, it fetched the then huge sum of £157,500, and set an auction record for a work by Brueghel. Five years later, in 1978, it broke its own record when it was sold for £260,000. 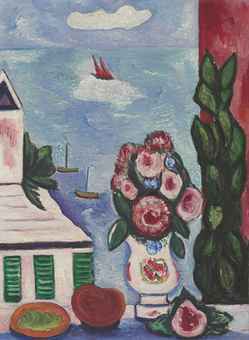 This winter, it will be offered for sale with an estimate of £700,000 to £1 million (lot 3, est. €890,000-1,270,000 / $1,130,000- 1,610,000). 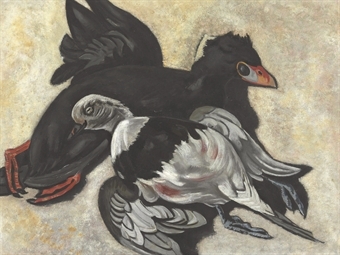 The sale will also present one of the first British bird’s eye views ever painted. Painted circa 1665 by an anonymous English artist, this large scale View of Llanerch Park, Denbighshire is not only a very beautiful work of art but also an extremely important historical document. The picture’s very early date makes it the first in a great tradition of bird’s eye views of British country houses. Testament to the birth of landscape painting in the country, the work also gives a very rare and astonishingly detailed glimpse of Llanerch’s garden, a lost jewel in the Welsh cultural crown. The painting has remained in the same family since the creator of the garden, Mutton Davis commissioned it in 1665. It will be offered at auction for the first time, with an estimate of £400,000- 600,000 (separate release available for further details). Further to the record set for a work by Artemisia Gentileschi (1593-1654) in Paris in June1, the Italian Baroque artist who was the first woman to become a member of the Accademia di Arte del Disegno in Florence features in the sale with an impressive full-scale depiction of Bathsheba at her bath. Painted probably in the 1640s, at the height of Gentileschi’s maturity, the work is offered at auction for the first time in its history with an estimate of £200,000-300,000 (lot 20, est. €254,000-380,000 / $321,000-482,000). Four years later, his father remarried Martha Marsden and the couple moved to Cleveland, Ohio, while Hartley chose to remain in Auburn, Maine, and live with his older sister until 1893, when he joined his father and stepmother in Cleveland. He enrolled as a student at the Cleveland School of Art where he was exposed to the transcendental writings of Ralph Waldo Emerson, which strongly influenced the direction of his career. In 1899, at the age of twenty-two, Hartley left Cleveland after receiving a stipend funding five years of study in New York. He first signed up for classes at the Chase School and transferred shortly thereafter to the National Academy of Design, where he became acquainted with future modernists Abraham Walkowitz and Maurice Sterne. He experienced his first taste of European Modernism when he came across the unique method of Italian painter Giovanni Segantini, known for his Segantini “stitch”, a small overlapping and interweaving brushstroke. Hartley’s colorful interpretation of this method would later become an identifiable characteristic in his work. 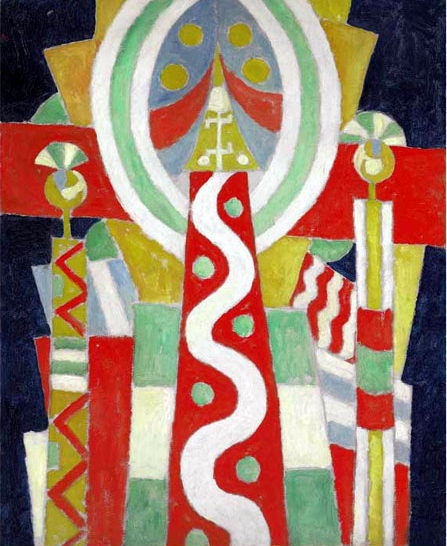 Hartley returned to Lewiston, Maine in 1906, at which point he decided to adopt his stepmother’s maiden name and began to go by the name of Marsden Hartley. He spent the following summer working at the Green Acre religious community in Eliot, Maine, where he became fascinated by spiritualism and mysticism. These interests, combined with his admiration for American tonalists George Inness and John Henry Twachtman, led to his early experimentation with incorporating symbolic aspects into his paintings of the surrounding landscape. 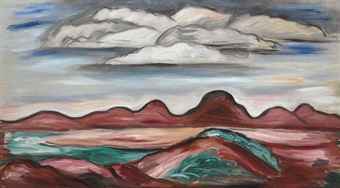 His personal response to and interpretation of Ryder’s work led to a stylistic shift in Hartley’s approach and his next series of paintings, known as the Dark Mountain paintings. 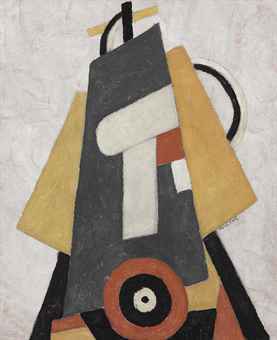 In these works, Hartley adopted a darker, monochromatic palette and his forms became much more expressive and abstract in their appearance. 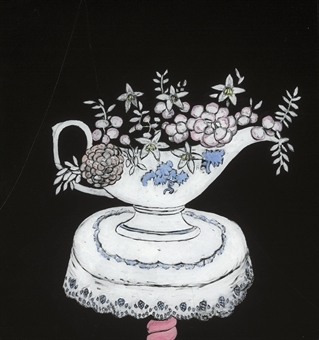 The two years Hartley spent painting in Berlin resulted in a body of career-defining work that was well-received by German audiences—he was one of only a few Americans invited to exhibit at Berlin’s largest avant-garde exhibition, Erster deutscher Herbstsalon, and also had work included in the prestigious Münchener Graphik-Verlag exhibition. Hartley remained in Germany until December 1915, at which point he was forced to return to New York by the escalating tensions caused by World War I. Life for the artist began a downward spiral upon his arrival back to the United States: his step-mother passed away less than one year after his father’s death in 1914, and the American public found an unwelcome sympathy in his German-inspired canvases. 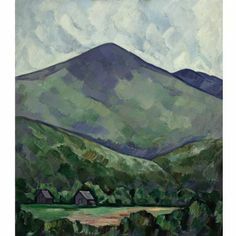 In an effort to reconnect with his American audience, Hartley briefly returned to his native state of Maine in search of artistic inspiration, before deciding to spend the summer of 1916 in Provincetown, Massachusetts. His attention focused on subjects typically seen throughout the area, resulting in elegantly abstracted depictions of sailboats and New England houses, as well as refined floral scenes and still lifes. 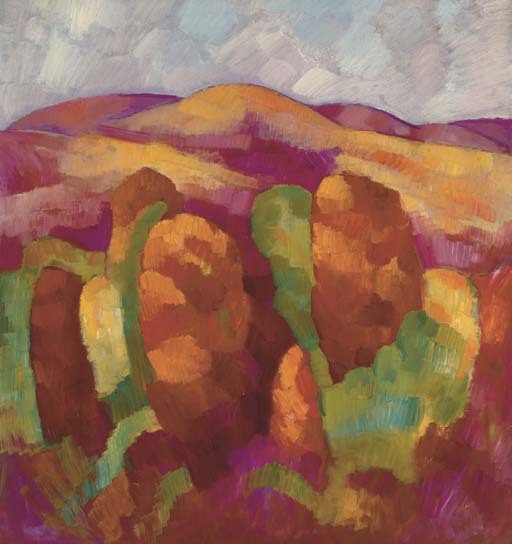 Craving a change in scenery, Hartley moved to New Mexico in 1918, where he was drawn to the areas of Taos and Santa Fe by the natural landscape and Native American culture. 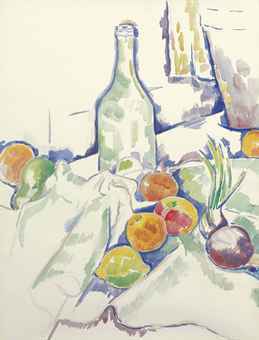 He developed a penchant for working in pastels during the eighteen months he spent in the southwest, where he naturally gravitated towards landscapes and still lifes. 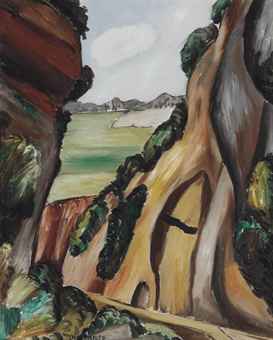 Hartley spent a majority of the 1920s in Berlin and France, where he continued to produce landscapes inspired by the natural landscape of New Mexico. 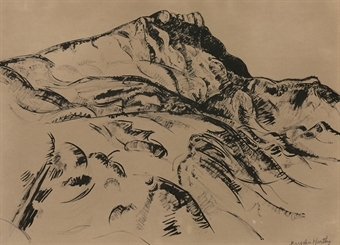 It was during this period, however, that his admiration for Paul Cézanne peaked; Hartley spent two years in the artist’s French hometown of Aix-en-Provence studying and painting, producing boldly-colored scenes of the area’s mountainous terrain that were considered an accomplished nod to Cézanne’s modernist approach. Hartley returned to the United States in 1930 only to be faced with the harsh aftermath of the stock market crash and the ensuing era of the Great Depression. However, just one year later, he experienced a significant turnaround in his career during a visit to Gloucester, Massachusetts. Just outside the town limits of this popular tourist destination, Hartley stumbled upon the barren landscape of Dogtown, an abandoned eighteenth-century city, and his painted scenes of the area were well-received by American audiences. 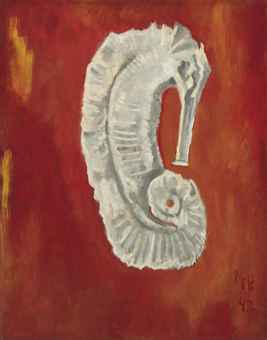 He was the recipient of a travel grant from The Solomon R. Guggenheim Museum in 1931, which funded a painting trip to Cuernavaca, Mexico; the following year a solo exhibition of his work was held at the Galeria de la Escuela Central de Artes Plasticas in Mexico City. Hartley left Mexico for Germany in 1933, and on this trip the Bavarian Alps held an aesthetic appeal for him. 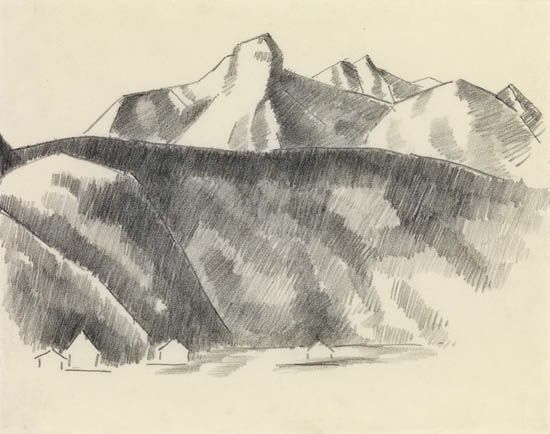 He set forth in making detailed studies of the mountainous terrain in silverpoint drawings and pastels. Hartley returned from Germany again in 1934 and worked briefly in the easel division of the Public Works of Art Project, but quit after only one month. He spent the next two years in Nova Scotia with the Masons, a French-Canadian fishing family, during which time he grew particularly close to the family’s two sons. 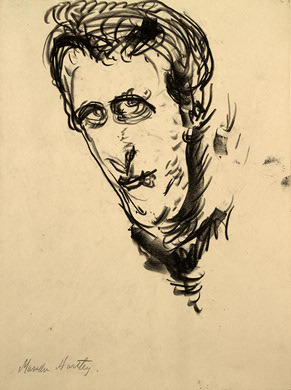 ; the tragic drowning of their two sons in 1936 affected Hartley so deeply that he created a series of portraits depicting the family, which are widely considered among his most moving works. Deeply charged with emotional undercurrents of love and the pain of loss, these works were rendered in a powerful yet simple style that distinguishes Hartley’s later works. Hartley retired to Maine in last years of his life, before passing away at the age of sixty-six in the city of Ellsworth. Since his death in 1943, Hartley’s work has continued to captivate American audiences, as well as those abroad; his work has been the subject of solo exhibitions and retrospectives held at prestigious institutions including the Amon Carter Museum of American Art, Fort Worth, Texas; The Art Institute of Chicago, Illinois; Phillips Memorial Gallery, Washington, D.C.; The Royal Scottish Academy, Edinburgh, Scotland; Smithsonian American Art Museum, Washington, D.C.; and Whitney Museum of American Art, New York, New York. Examples from his oeuvre are highly sought-after by both American and European collectors—several of Hartley’s still lifes, New Mexico landscapes, German paintings, and Maine scenes have individually realized over one million dollars at auction. His work is represented in the permanent collections of over one hundred distinguished museums and institutions, including Crystal Bridges Museum of American Art, Bentonville, Arkansas; The Metropolitan Museum of Art, New York, New York; Museum of Fine Arts, Boston, Massachusetts; Museum of Fine Arts, Houston, Texas; National Gallery of Art, Washington, D.C.; and Pennsylvania Academy of the Fine Arts, Philadelphia, Pennsylvania. 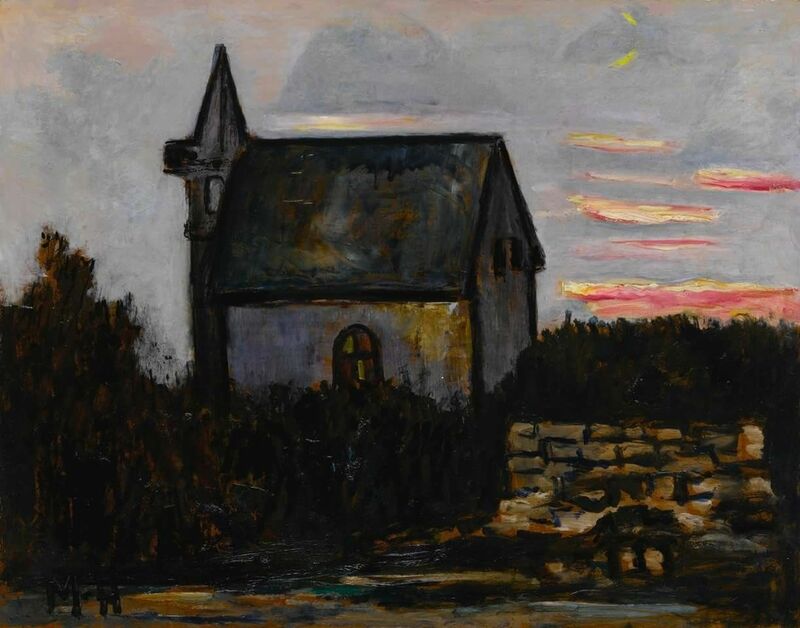 Acquired by the present owner in 1971, Church by the Barrens, Indian Harbor, Maine is a bold example from Marsden Hartley’s mature period, during which the landscape and people of the artist’s home state of Maine became the primary focus of his work (estimate $800,000/1.2 million). Here he captures the splendid effects of the Maine sunset, imparting an undeniably romantic view of his home and revealing the deep inspiration he gleaned from it. 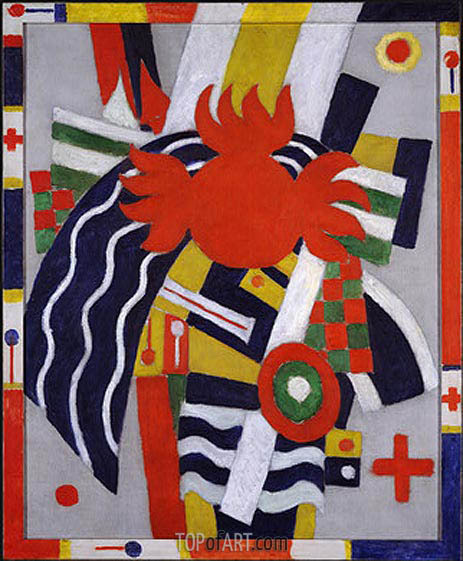 This important period of Hartley’s career is also the focus of the exhibition Marsden Hartley’s Maine, currently on view at the Metropolitan Museum of Art. 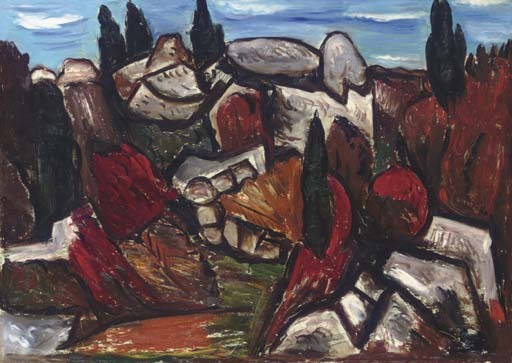 New Mexico also served as a point of inspiration for Marsden Hartley, who once wrote that New Mexico is “the perfect place to regain one’s body and soul”. 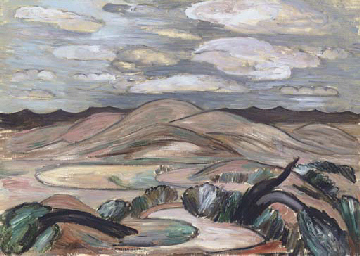 Landscape, New Mexico is one of his most dramatic depictions of the region (estimate $800,000/1.2 million). 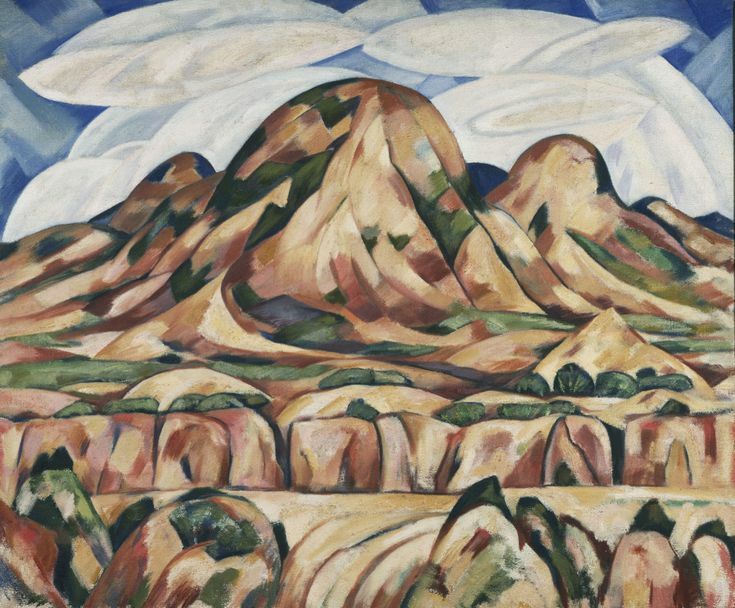 This 1923 work belongs to Hartley’s deeply significant New Mexico Recollections series, a group of approximately two dozen works painted in Berlin that embodies the artist’s respect for and embrace of the American landscape as subject matter. 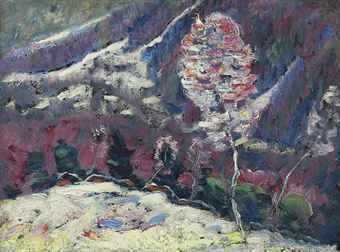 Marsden Hartley’s Mountain #22. 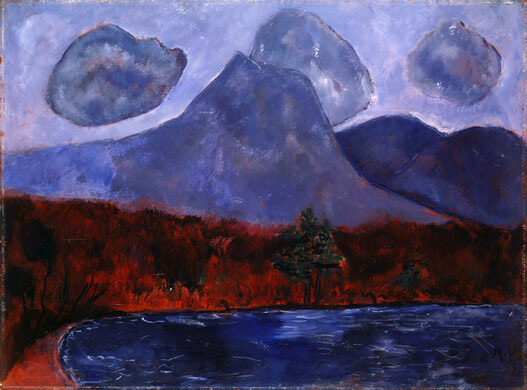 After returning from an extended sojourn in Europe and unable to face either his critics in New York or bitter memories from his childhood in Maine, Marsden Hartley spent the summer of 1930 in the mountains of New Hampshire. 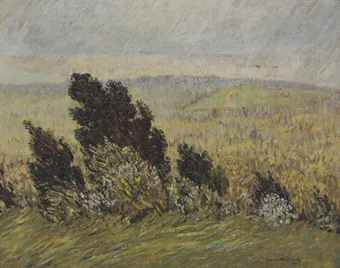 While there, he painted a series of works, including Mountain No. 22 (est. 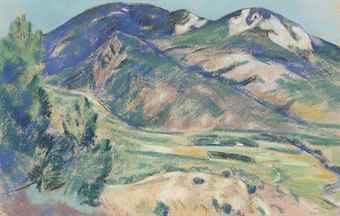 $800,000/1.2 million), that depicted views of the American wilderness reminiscent of Cezanne’s views of the French countryside. Mountain No. 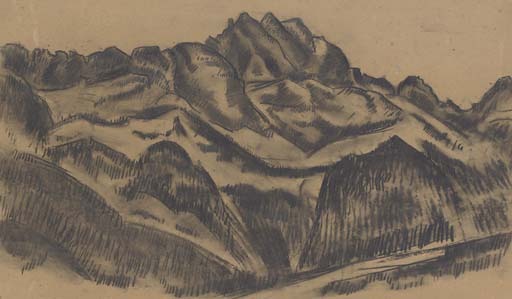 22 creates a bold visual effect in which the viewer’s focus is drawn to the imposing mountain and is considered one of the artist’s best works from this series. 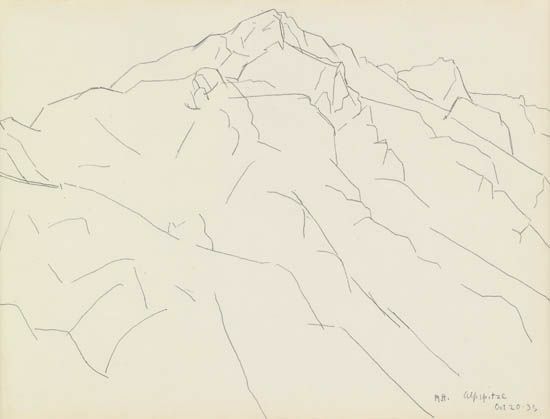 From the Whitney Museum of American Art comes Marsden Hartley’s Mountain, Number 21 (est. $800,000/1.2 million). Painted in1929-1930, just after the artist returned to the United States from France and settled in New Hampshire, this work reveals Hartley’s technical development away from the Cezanne-inspired style that dominated his earlier paintings of MontSainte-Victoire in Aix-en-Provence. 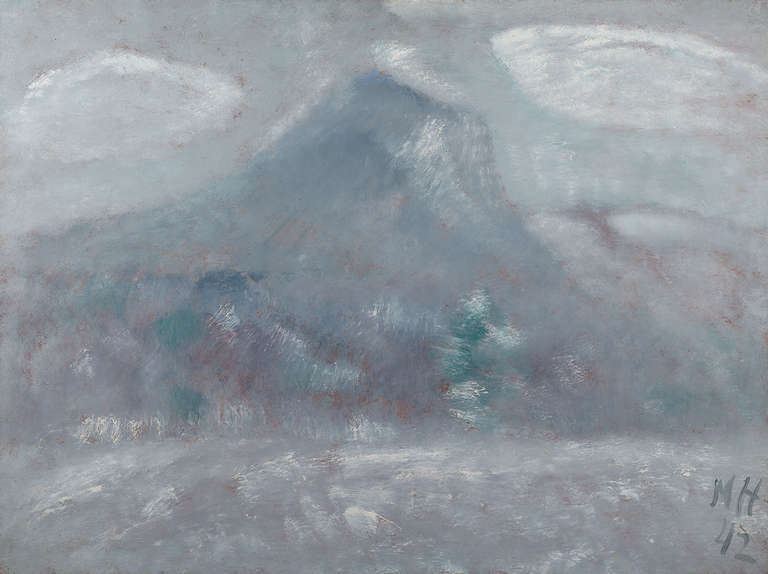 It is clear from this work that New Hampshire’s White Mountains provided Hartley with renewed enthusiasm and inspired a periodof great artistic creativity. Painted in 1916, Movement, Sails is one of the earliest and most advanced Cubist paintings produced in America. 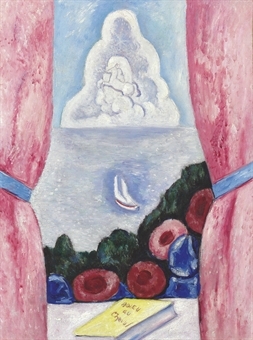 Marsden Hartley created this seminal work and a series of related paintings during a three-month stay at the lively summer colony in Provincetown, Mass. 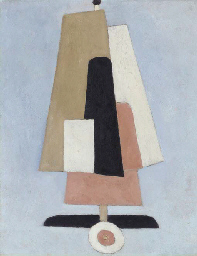 In the simplified composition of Movement, Sails, flat planes and muted colors have replaced the crowded spaces and brilliant palettes of Hartley’s earlier works. 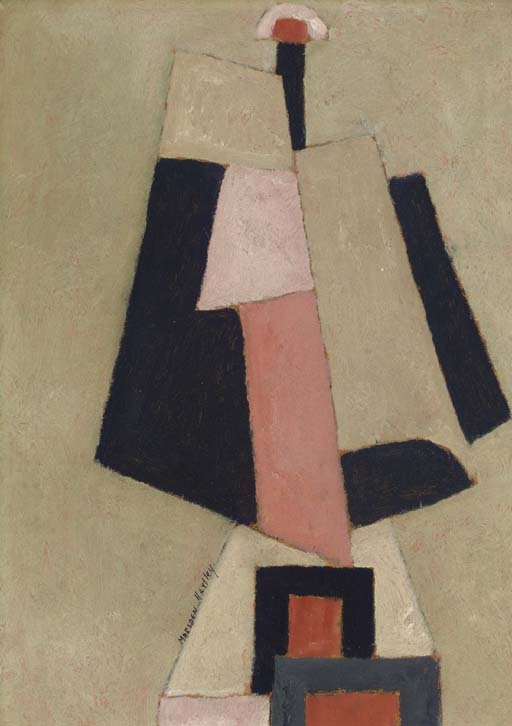 This acute reduction of abstracted elements was revolutionary for an American painting in the late 1910s. The Movement series marked Hartley’s final experimentation with pure abstraction. His shift from symbolist Expressionism to the subdued Cubism of Movement, Sails was followed by the return of figurative elements in his art. The rapidity of these changes in style demonstrates his continual experimentation and innovation, and distinguishes Hartley as one of the most important American artists of the twentieth century. 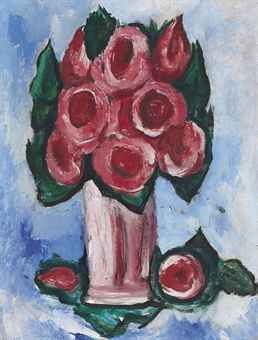 Painter, poet, and pioneer American modernist, Marsden Hartley was born in Lewiston, Maine, in 1887. Displaying an early talent in draftsmanship, at the age of fifteen Hartley won a scholarship to study at the Cleveland School of Art. In 1898 he moved to New York City and attended the art school of painter William Merritt Chase before studying at the National Academy of Design. 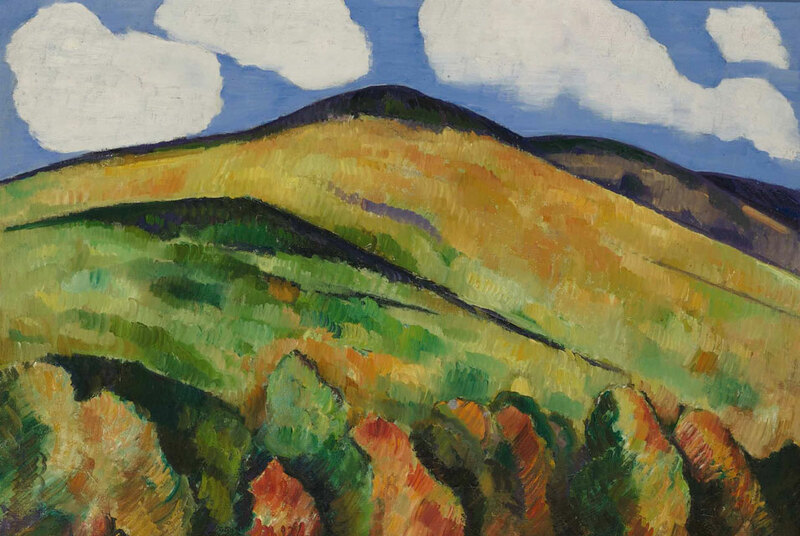 Returning to Maine, he painted landscapes in postimpressionist and modernist styles that reflected his artistic training as well as his recent exposure to groundbreaking artists and ideas. His first solo exhibition was held in 1909 at Alfred Stieglitz' influential gallery 291. With financial support from Stieglitz, Hartley was able to make two trips to Europe between 1912 and 1915. He went to Paris, where he experienced postimpressionism, fauvism, and cubism first-hand. Unlike most of his fellow Americans in Paris, Hartley sought the company of German artists working there. Not only did they share his affinity for expressing emotion in their work, but they were intrigued with the theories of mysticism. These concerns ran counter to cubism's highly intellectualized approach, but for Hartley German expressionism proved to be a complementary influence. 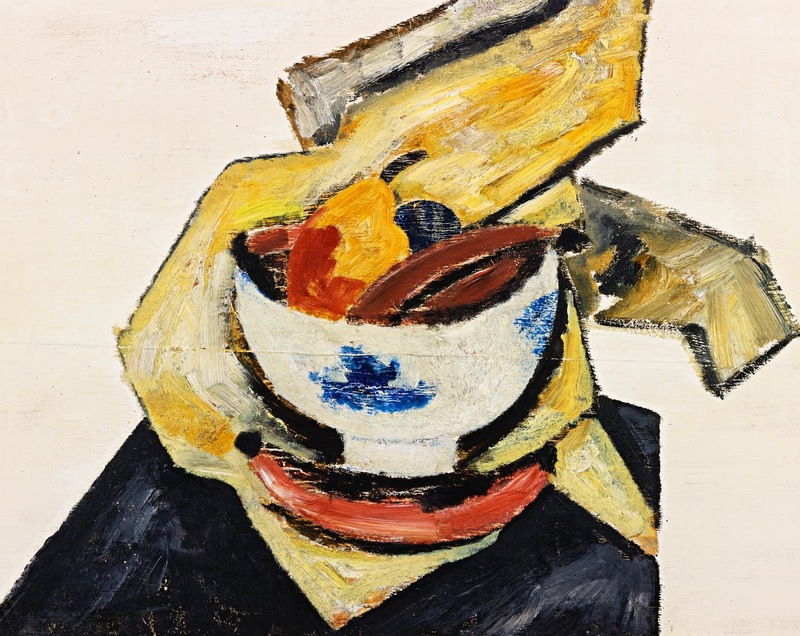 During a second visit to Germany in 1914-1915, the artist forged a personal style in which he combined the tightly structured arrangement of flat planes--a concept borrowed from synthetic cubism--with the dramatic color and loose brushwork of expressionism. Returning to the United States in 1915, Hartley traveled across the country painting mostly abstract landscapes. In 1921 he returned to Europe where he remained for about ten years, restlessly moving from France to Italy and then Germany. Hartley continued to experiment with European styles, often using recollections of the American landscape as his subject matter. After coming back to Maine in the mid-1930s, Hartley reverted to a more straightforward interpretation of nature. 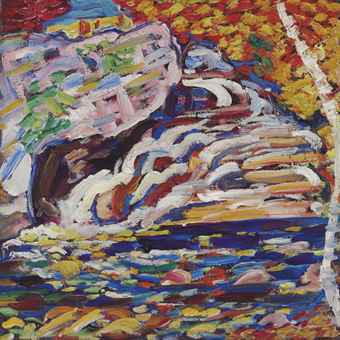 His bold and expressive paintings of New England's mountains and coastlines began to win critical acclaim. Not until after his death did the artist gain widespread critical success.